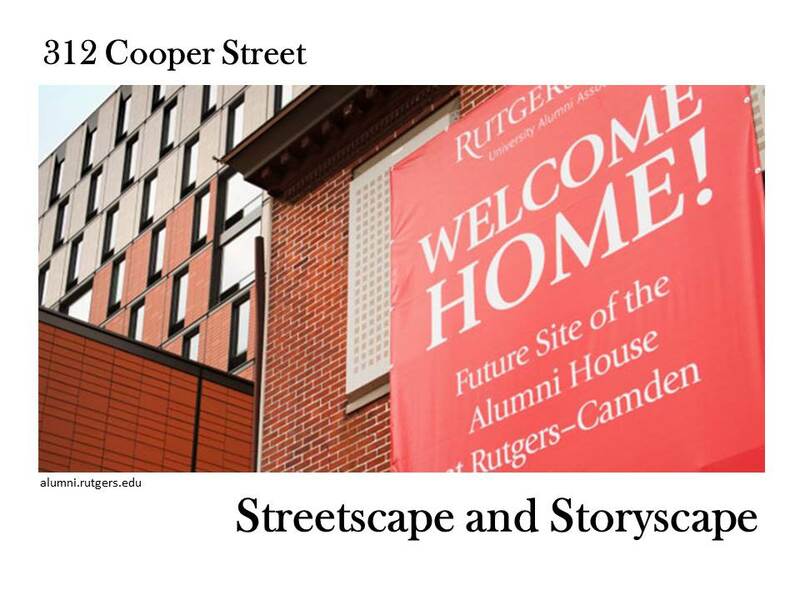 Graduate students at Rutgers-Camden are exploring the history of the Cooper Street Historic District, which borders our campus. Watch this blog for our discoveries in the archives! Read about Rachel Craft, newly graduated and beginning work as a historian with Hunter Research in Trenton. Read about Sharece Blakney, whose research about the Jubilee sisters of Cooper Street opened avenues to additional projects. The small cylindrical bottle stands at just under five inches tall and one inch in diameter. Text prominently embossed along its length identifies its former contents as Mrs. Winslow’s Soothing Syrup, Curtis & Perkins, Proprietors. The traditional account of the medication is that it was first created prior to 1844 by a Mrs. Charlotte Winslow of New York, and marketed by her son-in-law’s firm out of Bangor, Maine and later New York City. Mrs. Winslow’s was marketed to mothers in the latter half of the nineteenth and early twentieth centuries as a panacea of childhood illness, guaranteed to soothe a colicky, teething, or otherwise distressed youngster so that he may sleep peacefully and heal from his ailment by morning. The innocuous name and gentle reassurances of its advertisements belie the insidious nature of the product: its primary ingredients were morphine sulfate and alcohol. The aqua-tinted bottle was one of several intact bottles, many once containing medicines, recovered during Phase II excavation of Feature 31, a brick-lined privy vault. The find was so unspectacular as to barely garner a mention – it is listed in the Cultural Resources Management report for the Cooper Street excavation as a generic medicine bottle and it is only in the detailed inventory that a description is given. This perhaps speaks to the ubiquity of the bottle in such digs; it is commonly traded on the collector market due to its popularity during the product’s lifespan and the sturdiness of the vessel. Medical knowledge in the early nineteenth century was rudimentary, still espousing the theory that diseases were caused by “miasma,” a foul-smelling vapor emitted by decaying organic matter, of which there was much in urban areas of the era. Morphine, with its pain-killing and euphoria-inducing properties, was believed to cure the diseases themselves, especially since it arrested bad reactions to traditional methods of healing. Morphine does have a constipating effect which made it effective against some of the more deadly ailments of the first half of the century, including cholera – which causes profuse watery stools – and food poisoning. Mrs. Winslow’s Soothing Syrup was only one of hundreds of these morphine-laced concoctions marketed to the mothers of America in the late nineteenth century, but it was the most popular and widely-available. It was advertised with trade cards featuring images of women and grinning children, almost invariably swaddled in white fabric and shown in healthful and notably upper-class environments: lying in bed, taking tea in a garden, or reclining under a shade tree at a picnic. The product so saturated culture in the Anglosphere that in 1878, British composer Edward Elgar named a piece for wind quartet after it. The reality was much darker: many children died after being treated with the syrup, which was pejoratively nicknamed “The Baby Killer” by the American Medical Association. Not all of these deaths were unintentional. Medical journals published tales of mothers claiming to have passed a lethal dose to their children through breast milk, or the unwitting tyke taking a fatal swig when left unattended with the bottle, though the doctors of these articles strongly suspected that mothers had intentionally overdosed the children. Once the Pure Food and Drug act of 1906 required labels on drugs like this, it was reformulated and eventually removed from the market entirely, replaced by much less lethal drugs like aspirin and antibiotics. It’s time to explore the creepy and possibly haunted! When we first began our project on the items found at the location that now houses the student’s of our wonderful Rutgers-Camden I was unsure how it was going to go. I had never researched an object as we are doing here, and I was concerned that I wouldn’t find anything on this little doll left behind…but I was incredibly mistaken. 3. At a village just sixteen miles off, There’s a merry ball tonight, Although the air is freezing cold, Her heart is warm and light. And there she watched with an anxious look, ‘Til a well-known voice she heard, And driving up to the cottage door, Young Charles in his sleigh appeared. The poem (and later turned song) continues to tell the tale of their ride to the ball. When they finally reach their destination the girl is frozen to death, cautioning women everywhere to not be vain. It was inspired by a story of a girl who did, in fact, freeze to death. Frozen Charlotte Dolls were created to be bathing dolls for children to play with either in the tub or trips to the beach. They were made to float in water, made of china with painted on hair and faces. These dolls were either made with painted on clothing or none at all, allowing little girls to make clothing for them with their mother’s help. There are a range of looks for these dolls as well, some shaped differently than others, but all recognizable as Charlottes. They also had a male companion doll, Frozen Charlie, possibly named for Charlottes male companion in the tale. They were also used to bake into cakes as a surprise, similar to the King Cake made for Mardi Gras. The dolls range in size, typically anywhere from one to four inches tall. The dolls occasionally came with a coffin for them to lie in, connecting further to the tale of Young Charlotte. They were also able to be bought in bulk, often by the dozen. When looking at our own Frozen Charlotte we can see that she is unclothed like many in her time and having faded painted hair and cute face. Though she is missing one of her legs, we are able to see a hole near her bottom, indicating that she had a stand in her original state. While I have a lot of research done on the tale and the doll itself, I am still looking into more about the culture around her. I have begun research into cautionary tales at the time as well as the culture of children in the home and toys in the 1850s-1900s. You can visit Charlotte as well as many other amazing artifacts at the Rutgers University Alumni House, 312 Cooper Street, Camden, NJ. I think my research has been going well! I never thought I would be able to write a 15-20 page paper on an old beer bottle, but now that I have found so much information, I have no idea how I am going to be able to get it all organized into a single paper. I also have organizational issues – but that’s a problem for another post. Our class project is to research one item displayed in the Alumni House from a dig on Cooper Street. The object I chose to research is a bottle with a little cork coming out of it. After more research I discovered that it is a beer bottle from a Philadelphia company. I started my research looking at the evolution of beer consumption in Philadelphia as well as the brewing industry in America. The coolest thing I have found thus far is that Philadelphia has an “America’s First Lager” historical marker. How cool is that?! The marker recognizes John Wagner as the first person to bring lager yeast to Philadelphia in 1840 from his native Bavaria. A lot of other sources also credit Wagner but it is not certain if he really was the first person to introduce lager beer. Continuing on with Wagner and lager yeast – my research into the beer industry in Philadelphia, around the late 1800s to the early 1900s, has me reading about a lot of German immigration to the city. German immigration is said to have been a great contributor to breweries, beer gardens, and the beer industry as a whole in Philadelphia. I thought my bottle would be a slam dunk, research wise. My bottle has the name of the company and the address right on the bottle. Chas Joly. No 9. Seventh Street Philadelphia. I was wrong. It has been so hard for me to find extensive research on the company or Chas Joly himself. I did manage to find marketing for the company and certain products in a circular – super cool to look at! I love looking at visuals in order to better understand what I am reading about. Oh, and I found an alarming amount of articles and books about bottle collecting. My bottle appears on a lot of websites for purchase. It seems like buyers are looking for the aqua blue bottle. My bottle is pretty clear. I wonder if it was once aqua or if the bottles are completely different. New research lead! Through my research I have not found anything substantial on gender and drinking beer but I am still looking! Women in history amaze me – they are fascinating! Did they drink beer from Chas Joly? Were they running breweries and lounging outside at beer gardens? Or were they working at beer gardens serving the beer..? So many new research questions. I hope to have more information for you on my next blog post! Also, I would love any suggestions/leads if you happen to know a thing or two about beer in Philadelphia. P.S. Here’s what my fingers looked like after handling the bottle. I read that the bottles were aqua in color so maybe this is some residual paint…I hope. It’s rather apparent that these brushes were common, everyday objects, and that typewriter manufacturers did not think they were important enough or beautiful enough to go into detail on. Over the years, as typewriters went from the norm to beautiful pieces of history, these brushes have gone missing from historical records. If none of the manuals include images of these objects, how do we know what they look like? What are they made of? Does it even matter? The object I am studying is one of these typewriter cleaning brushes. Upon first glance, my classmates and I believed this to be a toothbrush – boy, were we mistaken. Written on the handle of the brush are the words “Typewriters Companion,” which I believe is the name of the company that produced these brushes – though I cannot seem to track down any information on the company itself. wood – my classmates and I have guessed that it is actually made of whale bone. The handle is 14 1/2 centimeters long, and 1/2 centimeters wide. This brush is lacking its bristles, though the holes where the bristles would be are very pronounced. There are three columns of circular openings; ten rows with three circles each, plus one extra opening at the top of the handle. There is green coloration on both sides of the handle, the side with the openings and the side with the slits – three slit openings, each about 4 1/2 centimeters in length. Though I have found little information on the manufacturing of these kinds of cleaning brushes, there are many questions I hope to answer (if information can be found): when was this object made (the whale bone material may help me answer this)? What material were the bristles made of? I know that American typewriter companies were the most popular, not only in America but across the globe, so did French companies like this one mainly manufacture typewriter accessories and tools? What is the cause of the green discoloration on the handle? Why is the handle bent? Everyone loves a good mystery. There is a thrill which accompanies the search for the truth, even when it has been buried for more than a hundred years. Such is the case with the nondescript bottle I selected from the Cooper Street dig site. The bottle is unembossed, meaning that it did not have any exterior markings indicating its make, model, or creator. It was recovered from feature 31 of the dig site, once a cistern turned dump site. My initial reaction was that the bottle was likely used for medicinal purposes during the early twentieth century and that it was probably mouth blown. As a result of my research I have been introduced to the fascinating culture of bottle collecting. As a historian one might imagine that I should have already known about these intrepid glass curators, however I was entirely unaware of the size and spirit of this group of hobbyists and historians. Consequently, when attempting to discover the origin and type of bottle I had chosen I had a wealth of information to assist me. “Short Neck Panel” Bottle found in the Cooper Street dig site. The bottle in question is a sight to behold up close (pictured right). Covered in an iridescent material, the bottle seems to shimmer under light. This is likely what remains of an oil coat finish which was used to smooth the glass once it was blown. The bottle is 5 and 1/4 inches tall and 13/16 of an inch wide at the base. On all four sides of the body the glass has been pressed inward making panels inside which labels could be pasted. The neck is 3/4 of an inch in height leading to a rounded lip. Based on this information and research done through the Department of the Interior Bureau of Land Management, I determined that the bottle is most likely a “short neck panel” bottle manufactured for patent or proprietary medicine. The most curious aspect of the bottle is its contents. The bottle still contains what appears to be the calcified remains of its original contents, having been kept in place by its still intact cork. If the bottle was indeed a patent or proprietary medicine bottle then it likely held pharmaceutical contents, however bottles of this make also could contain castor oil or flavoring extracts. I continue to be curious about the contents of this bottle and hope for a way to discover what they were originally. It would aid a great deal in telling this particular bottle’s story. The blackened substance is likely what remains of the cork. While knowing the particular type of bottle discovered in the dig site helps narrow the search for its identity, it has not yet granted me the satisfaction of knowing precisely what artifact I was working with. I have determined how the bottle was made (mouth blown into a two-part press mold), the design, and the purpose of the bottle, and yet there is so much more to discover. Where did this bottle come from and where was it made? The type of bottle makes it more likely to be present in the late nineteenth century as opposed to my initial guess of twentieth century. There were many glass foundries in New Jersey that could hold the answer, however if the bottle was indeed a mass produced design (such as ACME brand) determining its origin may prove more difficult. To help in this research I plan on delving deeper in the pharmaceutical culture of Philadelphia and Camden in the late nineteenth century with the hope that it reveals more information on the bottle and its contents. The bottle is currently displayed at the Rutgers University Alumni House, 312 Cooper Street, Camden, NJ. As French anthropologist Claude Levi-Strauss once stated, “Objects are what matter. Only they carry the evidence that throughout the centuries something really happened among human beings.” At times artifacts or objects are easy to pass by without a thought, yet they hold an abundance of information about a society’s’ ideas, beliefs, and culture. As I looked at the artifacts recovered from the dig on Cooper Street, it became apparent that these objects held stories that were waiting to be told. While many of the artifacts were interesting, one stood out to me in particular. This object is made of glass, standing at about 7 inches tall and 4.5 inches wide. This object was put together piece by piece, with a few major shards missing from it. Visually, it is opaque and has some dirt in the grooves at the top where a screw-lid should be. Physically, the jar is smooth but rough and jagged around the areas where shards of glass are missing. This artifact is a glass Mason Jar with a monogram on the reverse side. I was immediately drawn to the monogram, which appeared to read “JCC”. However, as my research continued, I discovered that there was more to the monogram than what it seemed to be (literally, more letters than JCC). The reversed side of the jar featuring the monogram. With the help of the archaeological report from the dig in 2012, I found that this artifact was described as a canning jar of Consolidated Fruit Jar Company dating back to 1872. While I was searching for this fruit jar company looking for answers, I realized that the answer was right in front of me. This photo was taken from an article about Consolidated Fruit Jar Co. from the website for the Society of Historical Archaeology Inc.
“Consolidated” WAS the company; it was based in New York, New York with the plant residing in New Brunswick, New Jersey. This was a company that included John L. Mason, the inventor and patent holder of the famous Mason Jar. This company was in charge of who could produce these famous jars at the time and were not the actual manufacturers themselves. After some turmoil within the business involving crumbling partnerships, competing manufacturers and patent issues, they created the CFJCo trademark on April 23, 1878. In discovering the origin of this monogram, it opened a door of information for me to continue my research and get a detailed history of the company. This will help me a great deal moving forward, but it will also raise more questions. If Consolidated granted permission to certain companies to manufacture their jars, which glass houses in South Jersey had this sought after connection with Consolidated? My search continues as I look for the possible companies. After I settle my questions with the company and production of these jars, I plan to move onto food preservation and how this changed the market and individual lives at the time. This artifact is proving to hold an extravagent story thus far. Of the artifacts displayed at the Rutgers University Alumni House, 312 Cooper Street, Camden, New Jersey, there are two items which easily catch the eye of any visitor. These artifacts are eye-catching because they are easily identifiable as needles or syringes. Yet, there is still an air of mystery about them. Upon closer inspection, they do not look like our contemporary needles. These artifacts do not have a hypodermic needle at the delivery end. Instead, the delivery end of the needle is elongated, but clearly not thin enough to be inserted under the skin. If the artifacts are not intended to inject medicine under the skin, what is their purpose? These items are similar in shape, but not size. Each artifact consists of two glass cylindrical parts with one cylinder wider than the other. The wider cylinder has two openings. The first opening is a small hole at the end of an elongated nose. The second opening is significantly wider with a lip which is wide enough to allow one to hold the cylinder between adult fingers. The second of the two cylinders is thin enough to sit in the wider cylinder and appears to act as a plunging rod. The second cylinder appears hollow but it is closed at both ends with one end having a wider top. In terms of color, the glass is brown or amber, but it is unclear if the coloring is from manufacturing, from discoloration over time or from its previous contents. Inter-mixed with the color is a flaky, metallic colored substance which falls from the artifact easily when touched. What is the flaky substance? Again, is it from the manufacturing, from usage or from recent storage? The glass is dry and odorless. The combined weight or the weights of the individual pieces are not unknown, but one can easily lift the items with one hand. When the separate pieces are combined and orientated with the elongated nose downward, the plunging rod will naturally slide to the lowest level in the wider cylinder. The syringe can be held easily between the index and middle fingers by the lip of the wider cylinder, but manipulation of the syringe with one hand may be difficult. If the plunging rod is partially extended from the wider cylinder, the thumb from the same hand can be effortlessly placed on the top of the plunging rod to depress it. If the plunging rod is fully extended, the syringe needs two hands to manipulate it due to its overall length. In any case, the thumb alone cannot easily move the plunging rod upward. It requires two hands to pull the plunging rod upward. The mystery of the artifacts’ purpose is magnified because the pieces do not have any markings or engravings, including measurement marks. Finally, when comparing the syringes side-by-side, another question arises. For the shorter syringe, why does the plunging rod protrude so much further from the end of the wider cylinder? Does such a difference change the ability of the user to manipulate the syringe? Could this artifact have been put together with the wrong pieces? Is there a piece missing from the plunging rod? Those questions must be added to the list of areas to explore. Artifacts, by definition, are objects that were created and/or modified by humans and are considered physical representations of the past. History was united with the present when, during the excavation of Cooper Street, two-clay smoking pipes were once more brought into the light. After conducting research, it was determined that these pipes were likely purchased from a tobacco and smoking accessory company, George Zorn & Company which had a storefront located at 524 Market Street in Philadelphia, PA. Relating the pipes to this company was not difficult as they were listed in Zorn’s 1892 Catalogue. They are now displayed at the Alumni House, 312 Cooper Street, Camden, NJ. Photolithography George Zorn & CO. Photo courtesy of the Free Library of Philadelphia digital archive. Opening slide from our presentation at the Alumni House Kick-Off Event, August 21, 2013. The Federal-style residence at 312 Cooper Street is one of the two oldest structures in the Cooper Street Historic District, dating to around 1810. Over time, it has been a family home, a school, a political clubhouse, and an office building. In recent times, it has been best known as the “Red Cross House,” the home of the Red Cross in Camden from the 1950s until 2007. On August 21, 2013, Rutgers-Camden kicked off a campaign to transform 312 Cooper Street into the university’s first Alumni House. We were proud to share our research on the house and its occupants with more than two hundred people who attended the kick-off event. Viewed over time, the many uses of 312 Cooper Street connect well with the history and mission of Rutgers-Camden as a place where generations have lived, worked, played, learned, and devoted service to the community.